An artist's concept of NASA's James Webb Space Telescope in space. JWST will follow in a long line of instruments that have changed humanity's view of universe — and our own place in it. A new documentary airing on the Discovery Channel tomorrow (Feb. 20), looks at the construction of NASA's James Webb Space Telescope, and its place in a long line of universe-changing instruments. "Telescope," a one-hour documentary, features interviews with many of the scientists involved with the James Webb Space Telescope (JWST), and footage taken at NASA's Goddard Spaceflight Center, where the movie's director, Nathaniel Kahn, has been filming and doing research for about two years. "It's hard to predict the impact that [JWST] will have [on astronomy], because I think it's going to be so big," Amber Straughn, an astrophysicist at NASA Goddard, told Space.com. Straughn, who is interviewed in "Telescope," is an extragalactic physicist, which means that she studies how stars and black holes form in distant galaxies. JWST, which is scheduled to launch in 2018, will help scientists study the very first galaxies to ever form in the universe, Straughn said. Scientists will often talk about the "impact" that a new instrument will have on science, or even on all of humanity. But illustrating that point and convincing an audience that it is true can be extremely difficult, either because the answer is long and complex, and takes time to sink in, or because the "impact" isn't necessarily relevant to the viewer. "Telescope" succeeds in showing that the use of telescopes has affected all of humanity, not just scientists, by changing what we know about the universe and our place in it. "People take for granted that [the telescope], more than any other instrument in the history of innovation, has changed our sense of ourselves," Kahn told Space.com in an interview. "And it's done it not once, but many, many times." Examples of this that are brought up in the film include the fact that telescopes played a critical role in showing humans that the Earth is not the center of the universe (or even the solar system). It wasn't until the 20th century that scientists had telescopes powerful enough to reveal the presence of other galaxies, providing the first real grasp of just how mind-bogglingly huge the universe is. It was telescopes that revealed evidence of the Big Bang, which at least partly answered the question, "Where did we come from?" or at least, "How long have we been here?" It was telescopes that revealed the presence of planets around other stars, and telescopes that may answer the question, "Are we alone?" "The history of telescopes is to teach us that we're not that special. It makes us less and less special every time we look at the universe and we learn there's much more out there than we thought before," Jason Kalirai, a project scientist for JWST says in the documentary. Many documentaries cover this territory, but the central point can get lost amid too much additional information about the science or history of these events. "Telescope" doesn't bite off more than it can chew, or more than a "general" audience can swallow. While going over this telescopic history, it weaves in information about JWST, and illustrates how it will be another rung on this ladder from which humans can better see the size of the universe and their place in it. The aspect of JWST's science plan that has just about everyone on the edge of his or her seat is the study of exoplanets, and specifically, their atmospheres. JWST is an important part of the journey toward answering the question, "Are we alone?" and it will do amazing things. But I do harbor some concern that the documentary overhypes JWST's exoplanet-studying abilities, especially whether or not it could identify signs of life on an exoplanet. Astrophysicist Sara Seager says in the film that for JWST to detect signs of life on an exoplanet (which depends partly on what the telescope can do and partly on what is out there for it to find), is like "winning the lottery five times." To be clear, that is an effective "No," and viewers shouldn't misunderstand those odds. On the other hand, maybe there's nothing wrong with playing the lottery once in a while; maybe hoping for extreme odds is even essential in order for people to willingly invest in major projects like this one. Thankfully, JWST has much higher odds for what it will accomplish in other scientific pursuits, such as studying the very first galaxies to form in the universe. Because the light from the most distant galaxies in the universe takes billions of years to reach Earth, scientists see those galaxies as they looked billions of years ago — meaning that in some cases, the scientists will be able to see the very first galaxies in the universe, just as they were in the very early stages of their formation. "The goal of studying those early galaxies is to sort of put together a picture or a story over time," Straughn told Space.com. "You're trying to progressively see how galaxies change over time. … We know that the earliest galaxies must be different from galaxies in the present-day universe." Only hydrogen and helium (plus very small traces of a few other elements) existed in the early universe, so the first stars must have been made purely of hydrogen and helium. What kind of impact would that have had on how those galaxies looked and how they evolved? 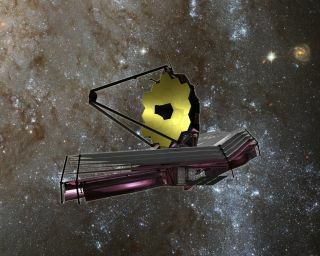 "That epic of the first stars and galaxies is really what we're after with JWST," Straughn said. "The really great thing about telescopes like Webb is that they're such general-purpose observatories," Straughn said. "It's an observatory that will cover the entire breadth of the universe, from our own cosmic backyard of the solar system, all the way out to the most distant things that we can't even see yet." The segments featuring people like Straughn, who speaks passionately and excitedly about JWST, are another strong point of "Telescope," and another element of science documentaries that can be taken for granted. "As a documentary filmmaker, what you look for is people who are able to talk about what they know about, but who are also able to convey their humanity," Kahn told Space.com. Referring to the scientists he interviewed for the documentary, Kahn said, "Their passion [for] their subject and their life study is so infectious and so wonderful. When you start to probe that part of the scientists' minds and hearts, you suddenly open up this wellspring of marvelous drama, which is very exciting from a filmmaking standpoint to get at. Too often, science programming is trying to get all the information in — which is terribly important, we have to get that, too — but sometimes the emotion of the scientists themselves doesn't make it." Kahn is an amateur telescope maker, and he got to know Matt Mountain because of his homemade telescope. Mountain, among other things, is the telescope scientist for JWST, and he is featured prominently in the film. Kahn began filming at Goddard two years ago, he said. During that time, he received some funding from the Northrop Grumman Foundation (Northrop Grumman is NASA's primary contractor for building JWST). Kahn began development of the documentary with Discovery channel about a year ago, a Discovery representative said. "Telescope" is a well-done promotion for JWST that will convey to just about any viewer the reasons why people, not just scientists, should be excited about this instrument. While it is not an in-depth look at the science, technology or history of JWST, it does discuss the many, many ways that the mission could fail — for example, the telescope has to unfold from its cramped payload fairing, unfurling like a butterfly emerging from a cocoon. If any part of that unfolding process goes wrong, the telescope could be effectively useless. In addition, it orbits too far from home to be repaired by a space shuttle mission (if there were still any space shuttles). And the documentary does not pursue this question any further: What would it mean for NASA if an overbudget, multibillion-dollar project did not operate optimally, or not at all? But those are heavy questions, and the consequences of a mission failure are best-explored when the potential benefits of the mission are fully understood as well. As I've said before in this essay, the ability to fully convey the potential awesomeness that JWST could beam down to Earth is not always easy. If "Telescope" seems like a simple look at this mission, it's because sometimes the simplest things take the most care to convey. "I think to reach out into the dark and to discover things, one has to take risks," Kahn said. "I think that that's what great nations do, and what great scientists do: take risks. So of course it’s a high-stakes mission. But nothing dared, nothing gained. "I think that it is missions like this that teach us to be bold, Kahn said. "Observing these people working together — it's given me courage, really honestly, in my own life. It's given me courage to be bold. Because I think that when you see people willing to spend years of their lives to build something that pushes the limits of what is possible, it's infectious. It's not enough to just get by. It's not enough to do what you did before. You have to push the limit of what you yourself are capable of," Kahn said. "Telescope" will air on the Discovery Channel on Saturday, Feb. 20, at 9 p.m./8 p.m. Central. Check local listings.